manages to define many geographical terms without needing text. 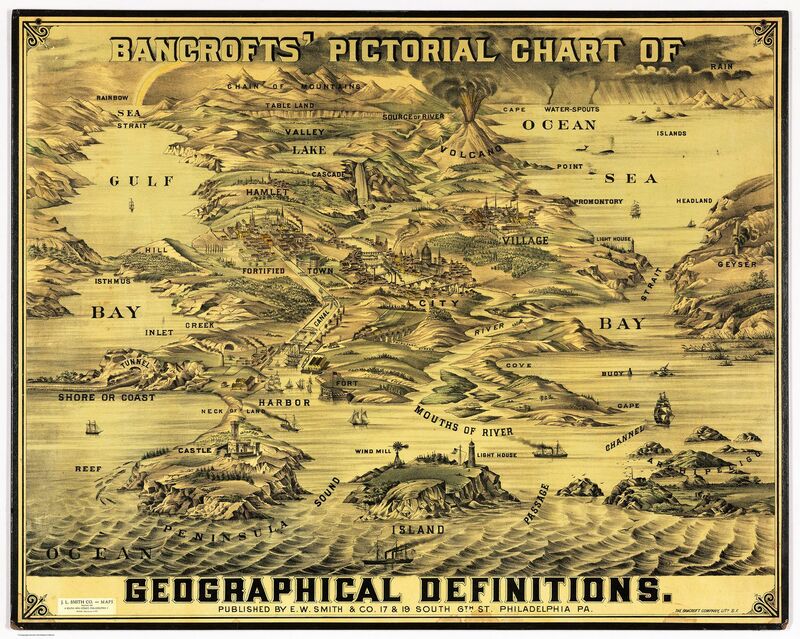 David Rumsey Collection : a chart of geographical definitions. You can see the original map, circa 1870, at the David Rumsey Collection (we've upped the contrast on this digital version to make it slightly more readable). What's the difference between a gulf and a bay? They're pretty similar, but a bay is often wider and has a wider opening to the sea. At the same time, some gulfs are larger than many bays (like the Gulf of Mexico). There's bound to be some confusion, since the terms are often used interchangeably. A cascade is a small waterfall. Channel versus strait versus passage versus sound? A channel and strait both connect bodies of water, but a channel is often wider. A sound is like a strait, but larger. A passage typically connects bodies of water between islands. However, the terms are often used interchangeably. In case it wasn't clear, a cove is a sheltered recess in a mountain. Now that you finally know what some of those half-remembered terms mean, the next step is obvious: Go out and see some in person.